The Bear who learns the meaning of Christmas from the Christmas Tree angel. The house was quiet and still. Bears stood in neat rows on lounge-room shelves dozing in the night-time summer heat. Suddenly, from inside the cupboard, with sliding glass doors, a voice spoke. ‘I feel very silly’ a small light- coloured brown bear sighed. He sadly shook his head. The huge white pom pom on his red and white hat bounced like a tennis ball up and down. ‘Ridiculous’ he muttered again. ‘I look absolutely ridiculous. No one else in this house has a bright red coat with white fur on the neck, arms and lower fringe like mine does. I’m the only bear wearing this stupid black belt too.’ His paw pulled at the buckle. ‘And, that’s another thing; why have I got a striped bag tied to my paw with a present in it? There was general shuffling and muttering but finally everyone went back to sleep. That is, everyone but Santa Bear. He sat peering into the darkness wondering. ‘How will I know when it’s the right time? I guess I’ll have to sit here and wait. Santa Bear waited. He had no idea what he was waiting for. He tried not to make any more fuss. The others had been in this house a lot longer than he had. They knew a lot more than he did. Still, it was very hard. Dressed as he was, he felt different to the others. He hoped something would happen soon to answer all his questions. He was often hot in his strange suit. How could I be expected to work in this very hot costume. As the summer days passed, he peered through the glass watching the children playing. His thoughts spiralled. What am I here for? Why do I look such a dork? Then, one morning after several days of rain, and a thunderstorm that made the house shake, unusual activities began happening in the room viewed through the glass. Mother vacuumed and dusted while everyone sang unfamiliar songs about a baby and snow and reindeers. They talked and laughed. ‘Christmas is coming! Christmas is coming.’ Everyone was laughing and shouting. The little bear pressed his nose against the glass and watched as a large green tree was placed in the corner. It was beautiful. The children carefully covered this tree's branches with twinkling lights and coloured strands of tinsel. Tiny figures and large bright balls were hung everywhere. His wish was granted that same night. On the shelves, and in the cupboard the other bears cheered. ‘Told him it would come his time’ Old Ted muttered to Joseph. 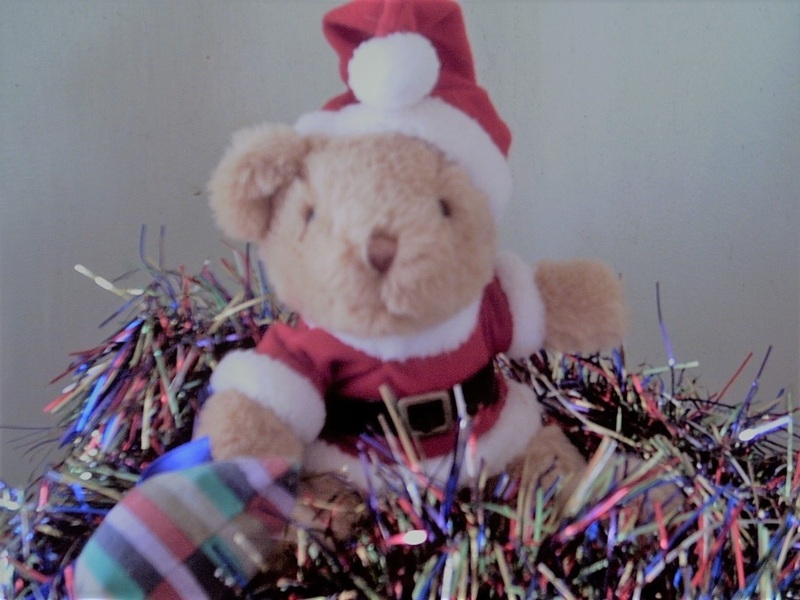 Santa Bear was placed on a special stand surrounded by tinsel. 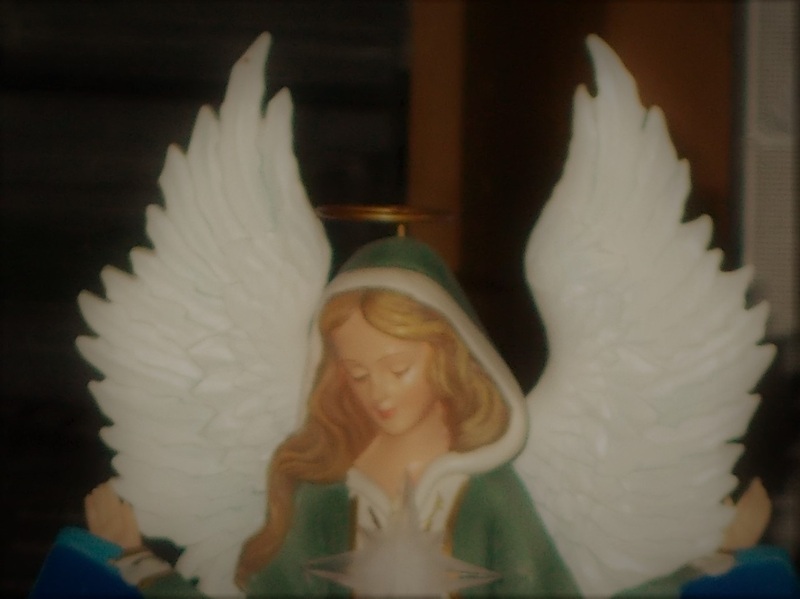 Then he was gently placed beside the Christmas tree. He had a wonderful view of the whole room. On Christmas Eve all the presents were placed under the tree. He could see that the one on his paw matched some of the paper on these gifts. He settled back. Now he knew he was in the right place. O Holy Night! A Child is Born! The music soared and filled the room. A strange peace and stillness settled over everything. He realized. They celebrated a birthday. They gave thanks for a baby called Jesus who came to show the world a better way to live and to follow Him and guide them into eternity. The Christmas angel cried softly. A gentle trickle of her tears fell on the small bear’s nose. ‘You, little bear, are a symbol of a sacred remembrance. This Child who came long ago is Love. This Child is Peace. A man in a red suit, many, many years after the Child’s birth, wanted all the poor and helpless to know about Him and His Love. He dropped gifts of fruit and nuts and often small gifts, down unlit chimneys. His red suit against the blinding whiteness of the freezing snow was a reminder to all of Hope for a better future. Santa Bear wanted to cry. His brown paw constantly patted at his watering eyes. I would not want to be any other bear in the whole world. A HAPPY, PEACEFUL, HOLY CHRISTMAS EVERYONE!